Learn to make Chocolate Roses with this photo tutorial! Chocolate Roses are easy, beautiful, and completely delicious! For easily printable instructions, please refer to the Chocolate Roses recipe. Edible roses can be made with many different materials, like fondant or marzipan. This tutorial uses chocolate plastic—otherwise known as chocolate paste—​which is an easy, moldable candy paste made from chocolate and corn syrup. You can use this chocolate plastic recipe to create the chocolate plastic for the roses. This recipe yields about six full-sized 3" roses, but the quantity can be adjusted by the size of the roses you make. Begin with a one-half pound of chocolate plastic. 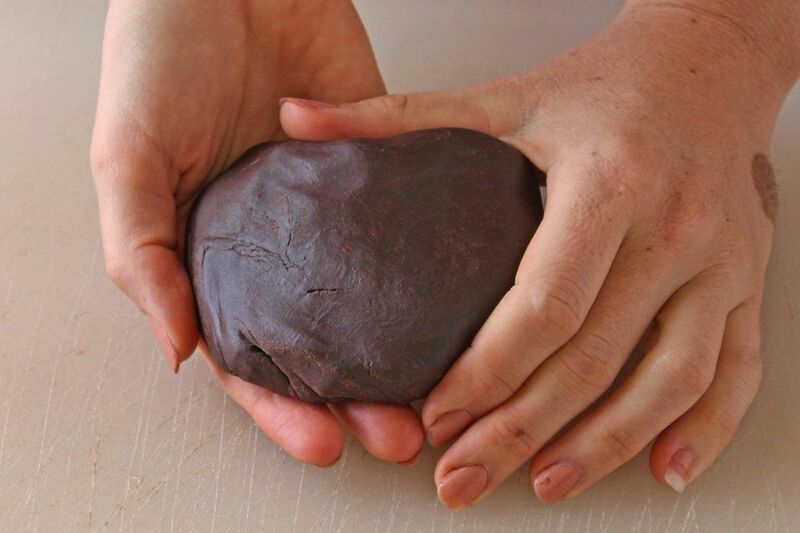 Start kneading your chocolate plastic until it is smooth and supple. If you are using white chocolate plastic, knead it in powdered sugar, and if you are using milk or dark chocolate plastic, knead it in unsweetened cocoa powder. If the plastic is too hard to knead, microwave it in five-second intervals just until it becomes pliable. Do not microwave it too long, or it will be too soft to work with. Dust your work surface and a rolling pin with powdered sugar or cocoa powder, and roll the chocolate plastic out into a very thin layer. If you are working with a large amount of chocolate plastic, you might want to divide it in half and roll it out in batches. Keep the portion you're not working with wrapped in plastic, so it doesn't dry out. Make sure your chocolate plastic is rolled into a very thin layer, less than 1/8" thick. Use a small round cutter to cut circles from the plastic. For one full-sized rose, you will need nine circles, and for rosebuds, you will need four to five. The size of the circle cutter determines the size of your finished rose. A 1.5” cutter will yield a full-sized rose that is approximately 3” wide. Begin by forming the center of your rose: take one of the cut circles and roll it into a cylinder. Leave a small hole at the top of the cylinder, and a larger hole at the bottom. Take another circle, and use your fingers to flatten one end of it until it is paper-thin. This will be the top of the petal, and it helps give the rose a more delicate look. You will repeat this thinning step with every petal you put on the rose. Wrap your first petal around the cylinder, making the top of the petal level with the top of the cylinder, pressing it at the bottom to adhere the chocolate plastic. With just one petal wrapped around your center, you now have a rosebud! If you want to stop here, curve the edge of the petal inward slightly so that it partially covers the center of the flower. If you want a flower in full bloom, curve the edge of the petal outward slightly and continue to the next step to add more petals. Thin out the edge of another circle to add a second petal to your blossoming rose. The trick to getting a lifelike rose is to slip the second petal underneath the edge of the first one, as shown in the picture. Add a third petal whose edge starts just under the second one to complete the first layer of petals. After adding three petals to your center, you should now have a small, half-bloomed rose like that shown above. You can stop here, or, to make a full rose, continue to the next step. Use the remaining five petals to add a second layer to the rose, thinning the top edges as before, and sliding the edge of each new petal under the previous one as with the first layer. Curl the outer petals back slightly to make your rose bloom. You will probably have a big glob of excess chocolate plastic at the base of the rose, so pinch off any extra plastic, and re-roll it with the plastic scraps to create more roses. Your chocolate roses are now complete! Allow the roses to sit at room temperature and dry for 24 hours. Once set, they can be stored in an airtight container indefinitely.